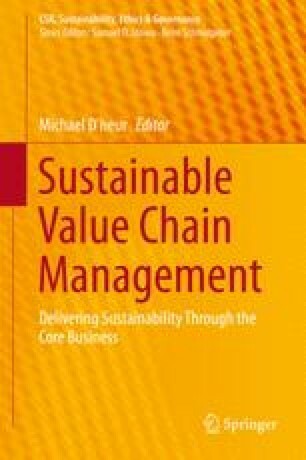 Implementing sustainability and transparency principles into supply chains is a considerable endeavor. In order to use this process as an asset in corporate positioning and to protect the company from risks and crises of confidence, communication needs to be strategically, dialogical and set for the long run. Besides this, communication has to play an active role as a process facilitator. Aegis Media Resolutions. (2011). Nachhaltigkeit – große Worte oder große Taten? http://www.aemediaresolutions.de/sites/default/files/Nachhaltigkeit_Text_September2011_0.pdf. Accessed 11 June 2013. DM. (2013). Presse. http://www.dm.de/de_homepage/presse/. Accessed 11 Juni 2013. Eigen, P. (2009). “Transparenz und Erfolg”, in Erfolgsfaktor Transparenz. http://www.transparenz.net/?p=1039. Accessed 11 June 2013. FTD. (2011). Pumas saubere Idee, financial time Deutschland (16.05.2011). http://www.ftd.de/unternehmen/industrie/:oekobilanz-pumas-saubere-idee/60053184.html. Accessed 11 June 2013. Hansen, T. (2013). Gastbeitrag ARD-Markencheck: Lieber mehr halten als versprechen! http://www.handelsblatt.com/unternehmen/handel-dienstleister/gastbeitrag-ard-markencheck-lieber-mehr-halten-als-versprechen/7616942.html. Accessed 11 June 2013. Hecker, J. (2012). “C&A, Transparenz in der Lieferkette”, in Erfolgsfaktor Transparenz. http://www.transparenz.net/?p=4705. Accessed 11 June 2013.